The Periodic table is something with which we’re no doubt all familiar. It’s long been the bane of junior high kids intent on passing science class as they have to memorize the names and positions of all the known elements. Well, almost all of them. Last Friday we looked at a 2004 Honda Element EX-AWD, and while there was much debate over the model’s pros and cons in the comments, its $6,200 price proved even contentious. That ended up being the closest result in NPOCP history—losing by one single vote by the time I did the tally. Yep, 5113 to 5114. Geez people, way to make my job harder. Today we’re highlighting this 1965 Honda CA77 Dream motorcycle. It’s pretty important when it comes to Honda’s history here in the States. The Dream debuted in the U.S. in 1959 and the model would, in various guises carry on through for the next decade. The vertical twin engine was made available in a number of displacements over that time. Here it punches out at 305ccs. Topped with twin, chain-driven cams the little twin features a 360° crankshaft which allows the two pistons to slide up and down in tandem although each firing on alternate strokes. Fuel is fed by a single 22mm Keihin carburetor. So equipped the 305 put out 24 horsepower at 8,000rpm. The CA-series proved a highly durable design as did the Dream that was wrapped around it. The frame is a T-shaped stamped steel affair with no downtube in front as the engine acts as a stressed member. The front forks are also stamped steel with suspension provided by springs and a leading arm at the base. Rear suspension is a standard swing arm with dual shocks however there’s some whimsy there too as the shocks are wrapped in squared-off sleeves. This is a ‘Late” Dream denoted by its model year and tank shape. 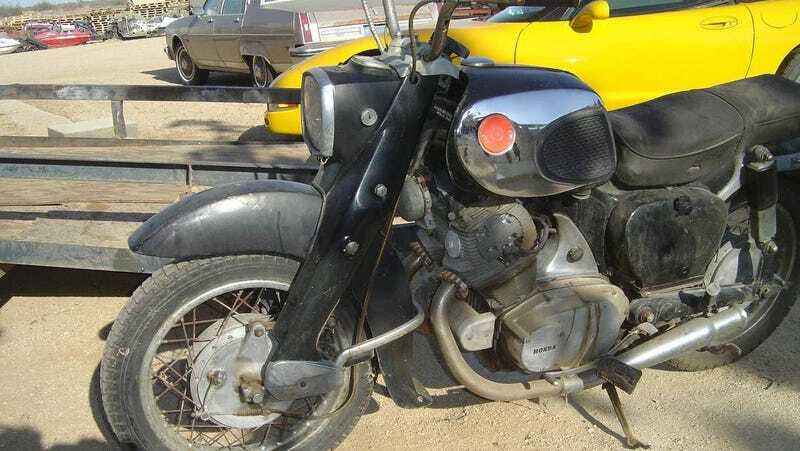 The bike is dirty and is described as a “Real Barn Find.” The red and amber reflectors on the tank are not original but that cool round peg/square hole head light sure is. The seller says he has the correct badges for the tank, but seeing as it’s going to need to be pounded out—there’s a dent big enough to have popped the paint off on the right—you might want to wait on affixing those. The fenders, with their jaunty flared tails, look to be in fine shape. The front fenders on these typically get bashed up from encounters with curbs, so that’s a plus. The rest of the bike needs a thorough cleaning at the very least. All rubber bits should be replaced and the brakes should be revived with new shoes, springs and cables. Luckily, the bike features mechanical brakes and so there are no hydraulics with which to deal. The ad claims that a battery and carb rebuild are needed to get the bike running. It also notes that the bike is all original with the exception of the muffler. There’s 11,956 miles claimed under the two tires and the seller says he has the pink slip. That pink slip is from 1975 however, and it looks like the last time the bike was registered was in 1985. It’s likely to be out of the DMV’s computer in that case. That could make transfer of title a bit more of a chore, but it’s not that big of an inconvenience. I do like the thought of the challenge bringing back this bike represents. One of those challenges—perhaps even an insurmountable one—is the price. The asking is $1,600 and obviously just by looking at the bike in the pictures you know that’s just the start. Of course every noble effort needs a start, and so it’s now up to you to decide if that price is a good one. What do you think, could that $1,600 asking make this Honda a dream? Or, is that more likely nightmare-inducing? This post has been updated since its publication.